This entry was posted on Tuesday, April 22nd, 2008 at 8:27 am and is filed under Best Idea Ever, I Did It for Schmience, It's new to me!, lolStella. You can follow any responses to this entry through the RSS 2.0 feed. You can leave a response, or trackback from your own site. All hail the Furminator!! Boo Kitty actually enjoys it and it does keep the hair issue under control. 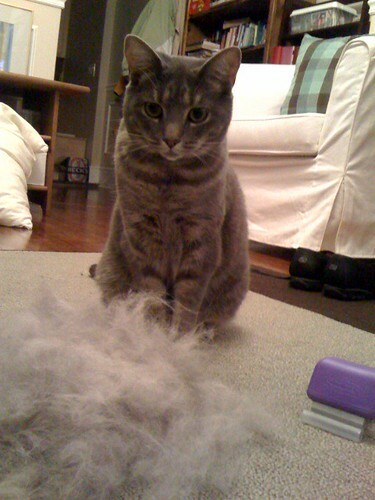 Dark furniture and black clothing + white 22 pound cat = well spent Furminator cost! Plus I think I could make an entire new cat out of what comes off. We also have a Furminator. Basil doesn’t seem to mind it too terribly much, but Mina is Not Interested. That will have to change if she wants to keep wearing her tutu. I saw that big pile of fur, and I said “I could spin that into yarn.” Jason looked at me nonchalantly, which is how I know he’s been Sonyafied. The first time I talked about turning cat hair into yarn he was horrified. Does cat hair felt? I could make Stella a toy out of herself. What? My grandma has a necklace made out of her mother’s hair.